Comments Off on A Statue to Mikoian? Eliciting public scorn, Yerevan Mayor Taron Margarian authorized the installation of a statue depicting Soviet-era politician Anastas Mikoian. The former statesman—whose career peaked when he briefly occupied the position of Chairman of the Presidium of the Supreme Soviet—was a supporter of Stalin, and is known for his involvement in the purges of the 1930s. In light of Mikoian’s recommendations to execute hundreds of Armenians, and his disregard for the 1915 Ottoman massacre, the name of Anastas Mikoian is met with scorn and derision. In response, Armenian activists are calling the monument offensive, and are collecting signatures for a petition supporting its removal. 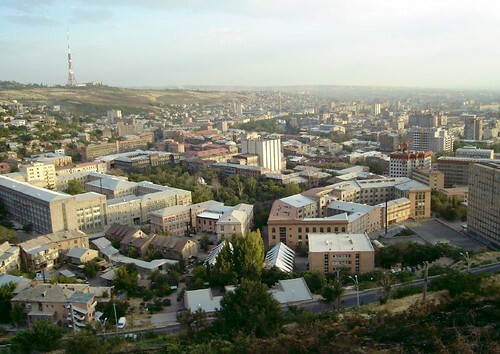 Indeed, Yerevan’s pro-Soviet City Council decision is seen by many as a political maneuver paying court to Putin in response to Armenia’s imminent alignment with a Customs Union helmed by Russia. Mayor Margarian however, countered the backlash by asserting that the inspection of Mikoian’s contentious misdeeds should be left in the hands of historians. Marianna Grigoryan. “Armenia: Controversial Communist to Get Statue in Yerevan?” Eurasianet.org, May 23, 2014. http://www.eurasianet.org/node/68400. “Yerevan Government Plans Statue to Soviet Leader.” Asbarez.com, May 6, 2014. Accessed September 30, 2014. http://asbarez.com/122737/yerevan-government-plans-statue-to-soviet-leader/. Poghosyan, Yekaterina. “Stalin’s Man Mikoyan to Get Statue in Yerevan.” Global Voices Caucasus, May 29, 2014. Accessed January 18, 2015. https://iwpr.net/global-voices/stalins-man-mikoyan-get-statue-yerevan.